Manage the complexity of EV charging and transform your charging assets into a flexible grid resource. Based on open standards, our EV charging network software enables grid operators to aggregate and control their EV charging loads to ensure an efficient and balanced grid. Click here to learn more about the benefits of an open network. Our grid balancing services can help grid operators avoid overloading their system by aggregating and shifting EV loads based on grid conditions and events. Our software can prioritize and control charging at times when additional grid capacity is needed. By helping utilities manage their EV charging load, their power usage and capacity requirements can remain the same — so they don’t have to expand their distribution infrastructure and can defer new investments. We develop a charging program that makes perfect sense for you, providing the hardware, software and support to ensure you build out on budget and on schedule. 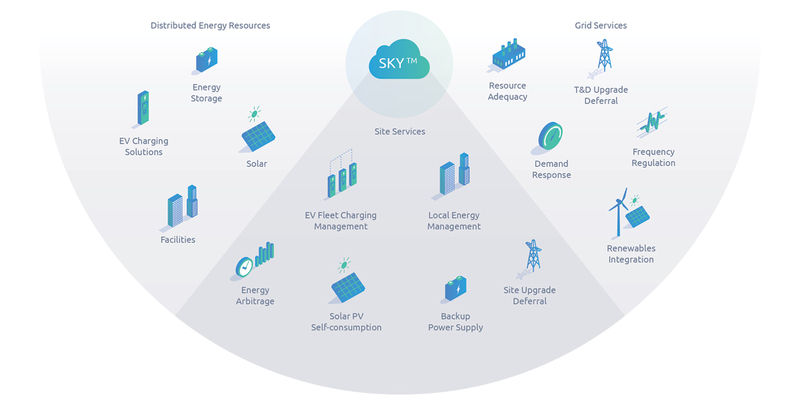 Greenlots SKY™ EV Charging Network Software enables utilities, smart cities, building owners and automakers to deploy and manage EV charging infrastructure. Greenlots smart EV charging solutions provide local optimization of charging to prevent peak demand charges and reduce the need for costly infrastructure upgrades. Greenlots SKY™ EV Charging Network Software enables utilities, smart cities, workplaces, apartments and condos, businesses and automakers to deploy and manage their own network of smart EV charging stations at scale.